Know what’s great about teaching a class like this? Restaurant Review Day! It gives everyone an excuse to relax, take a couple of classes off, and… eat! Anyway, I called Applebee’s ahead of time to let them know we were coming. Granted, a TRUE restaurant review would have been more ninja-like, but there’s a fine line between incognito and rude, in this case. Having 15 people show up unannounced and during the lunch rush would not have been nice, AND we would have been waiting f o r e v e r for a space to seat all of us. Calling ahead was beneficial to both of our teams. I had the students take their Restaurant Review papers with them, so they could write as they went. Having the prompts there was nice, because it gave them things to think about that normally wouldn’t have crossed their minds. 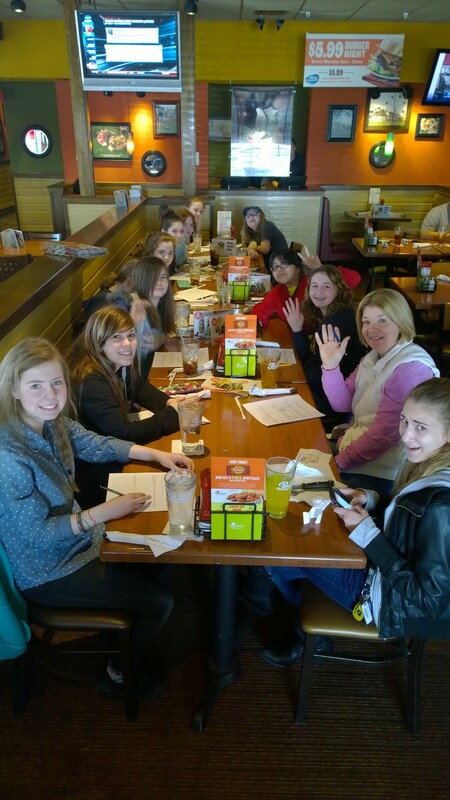 I had the students bring their own money, which included extra for a 15% tip. Homeschoolers love real-world experiences! Anyway, it was a great trip, and I can’t wait to do it again! Here’s the Restaurant Review if you need one yourself. We have had snow day after snow day after snow day here! You’re probably wondering what homeschoolers do when there’s snow days. Well, we sled and shovel, just like everyone else. Also, remember that we have a large co-op, and we meet in an actual school building. It really makes us appreciate the on-the-couch-in-pjs days. However, this year has been a little more than unusual, and we’ve been trying to conduct school on a hot-or-miss basis. And just in case Old Man Winter hasn’t heard it from the rest of the nation, we’re DONE with it. Spring, please hurry up. I decided to combine Lessons 7 and 8, because they work hand-in-hand. In Apologia’s Exploring Creation with Human Anatomy and Physiology, Lesson 7 is Life in the Blood, and Lesson 8 is the Cardiovascular System. Lapbook: Lesson 1 can be found here. Lapbook: Lesson 2 can be found here. Lapbook: Lesson 3 can be found here. Lapbook: Lesson 4 can be found here. Lapbook: Lesson 4B can be found here. Lapbook: Lesson 6 can be found here. Lapbook: Lesson 9 can be found here. Lapbook: Lesson 10 can be found here. Lapbook: Lesson 11 can be found here. For this section of our World’s Largest Mammoth Lapbooks, I used parts from Knowledge Box Central ( Chapters 1-7 can be found here. Chapters 8-14 can be found here), Scholastic’s The Body Book, by Donald M. Silver and Patricia J. Wynne, Scholastic: Easy Make & Learn Projects: The Human Body (it’s downloadable – yes! ), and my own foldables, available below. This section will be attached to the main lapbook, behind the lung section. This shows the first layout, showing all the file folder pieces used, and the first part of the Lesson 7 pieces. In this picture, I folded up the bottom, so we can concentrate on the top. Here’s a close-up of the layout for this panel. Another close-up of a panel. Here’s the top-most panel folded down. Here’s the top left panel folded in. The panel folds down to the center area. When we open that top panel back up (through the magic of the internet), we see Lesson 8’s parts. The bottom panel is folded down to reveal a heart model. The left panel is opened. Here’s the entire Lessons 7 and 8 lapbook section opened. Wait. Lesson 6? What happened to Lesson 5?!?! Lesson 5, in Apologia’s Exploring Creation with Human Anatomy and Physiology happens to be nutrition, and I decided that, while it is important, we needed to focus on the body parts. So, we skipped Lesson 5, and (if we have time at the end of the year) we’ll visit it. Lesson 6 covers the Respiratory System, so don’t forget to breathe. We’ve already done some fun things, including building a couple of models and an experiment, and our lung dissection is scheduled for next week. Lapbook: Lessons 7 and 8 can be found here. For this section of our Mega-Monster lapbook, I used Scholastic’s The Body Book, by Donald M. Silver and Patricia J. Wynne, along with some of my own foldables you’ll find below. This is the section as it’s first opened. The middle flap is lifted up. The side is opened to the left. Here, I’ve added the inflatable lungs we made in class. They’ll fold up into the lapbook. Here’s our lapbook monster featuring Lesson 4: The Digestive System. In Apologia’s Exploring Creation with Human Anatomy and Physiology, they add in the Renal System. We’re going to keep it separate in our lapbooks, even if it’s only a page of information. I didn’t use too much of Knowledge Box Central’s lapbook foldables this time. In fact, I was really disappointed! It only had one foldable for the entire Digestive System! Because of that, I had to supplement a LOT of pieces. 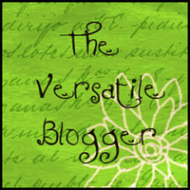 I also found this downloadable (yay!) book from Scholastic: Easy Make & Learn Projects: The Human Body. This is where that giant inside-view of the girl comes from. We aren’t doing any more standard tests in this class. The cool thing about homeschooling, is that we can add, subtract, and do whatever we need to do to make learning happen. Here’s the stuff I made. Download and use what you wish. Here’s our ever-growing lapbook pictures to see how it’s put together. All the blank areas are for our photos of our projects. As we continue through our body-discovery, our lapbooks continue to grow. And grow. We just finished up Lesson 3: The Muscular System, using Apologia’s Exploring Creation with Human Anatomy and Physiology. L3 Lapbook – Illustration of tendons and muscles – This is an illustration of muscles and tendons for the kids to color. 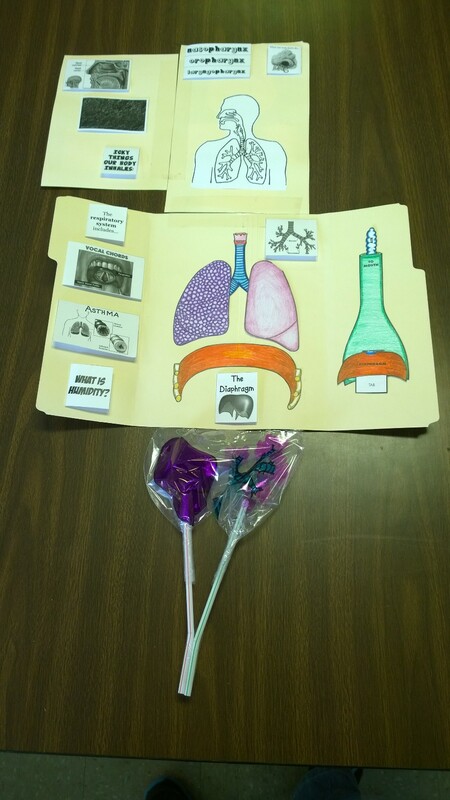 L3 Lapbook – Analyzing Beef Brisket – Draw what is seen when looking closely at beef brisket. L3 Lapbook – Antagonistic Muscles – This is a supplemental foldable. L3 Lapbook – Cardiac Muscle – This is a supplemental foldable. L3 Lapbook – Drawing of a Muscle – Draw and label the parts of a muscle, found in the book. L3 Lapbook – Masseter Muscle and Tetanus – This is a supplemental foldable. L3 Lapbook – Muscle Tests – This is a place to record the results of doing different muscle tests. We chose eating a cracker for the smooth muscle, timing our heartbeat for the cardiac muscle, and opening and closing a clothespin for the skeletal muscle tests. L3 Lapbook – Muscle Weight – This is a card to record how much the student has in muscle weight. 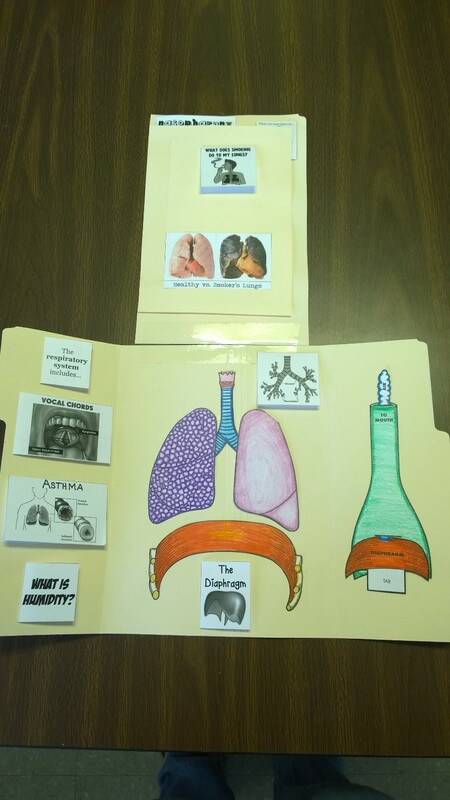 L3 Lapbook – Muscular Diseases and Disorders – This is a supplemental card. L3 Lapbook – My Biggest Muscle – This is a supplemental foldable. L3 Lapbook – Skeletal Muscles – This is a supplemental foldable. L3 Lapbook – Tendons – Tendonitis – This is a supplemental foldable. Blood & Guts. At least, that’s what we’re calling it, because the kids think it’s a cool name. What we’re actually studying is Apologia’s Exploring Creation with Human Anatomy and Physiology (whew!). We’re creating this wicked-awesome lapbook in the class, and I just thought I’d take pictures of my example piece as we go, so in case you’ve got a hankering to make one, you won’t have to reinvent the wheel so much. Before we go on, let me just start off by stating that I have 14 kiddos in my B&G class. *cough* I do have a fabulous helper, Mrs. Sharkey, but 14 is still a LOT when you have stuff to read, assignments, experiments, projects, dissections, and then… the lapbook. The Lord grants me a tiny shred of sanity every time I think about this class, and I think that’s why I keep going. I also keep thinking maybe someday I’ll get a raise. Oh. Wait. I homeschool. The base of the lapbook is from Knowledge Box Central. (****UPDATE (10/15/2017)**** KBC moved their link. It used to be divided in two purchases, but they’ve combined it into one. Smart move on their part!) Chapters 1-14 can be found here. I could have stopped there, as it’s a nice lapbook, BUT… I didn’t. I wanted to add body parts the kids could color, so I used Scholastic’s The Body Book, by Donald M. Silver and Patricia J. Wynne. Now, THIS book is SO COOL! You’ll see most of the parts as we progress through the year. I could have stopped there, as now we have the makings of an awesome lapbook, BUT… I didn’t. Now it’s my turn to step up the game. I wanted to emphasize certain sections as well as create extra parts for our experiments and projects, so the .PDF files you’ll see listed below are ones I created to fill in some blanks and make it wicked-awesome. Kind-of like Emeril: Bam! Kick it up a notch! Please note that most of these lapbook parts I’ve created are with the idea that more than one student are being taught (I have 14 kids, remember! ), and I try to conserve paper by having multiple foldables, etc. on one sheet. If you’re only teaching one child, you’ll have extra parts. 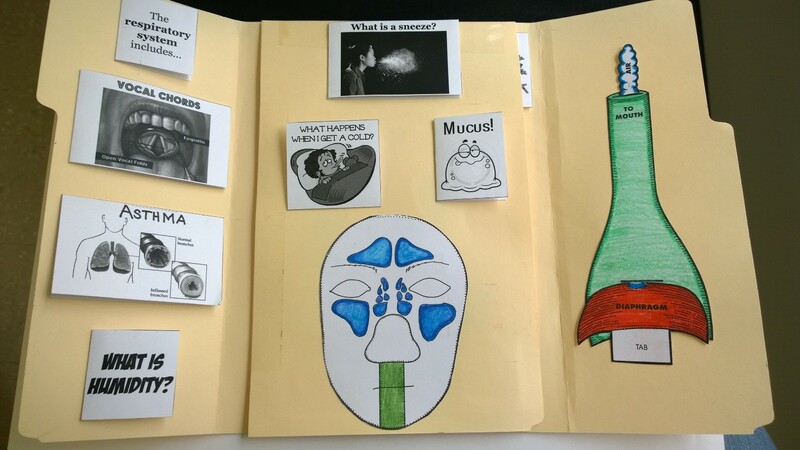 L1 Lapbook – Humors – This is a supplemental foldable. 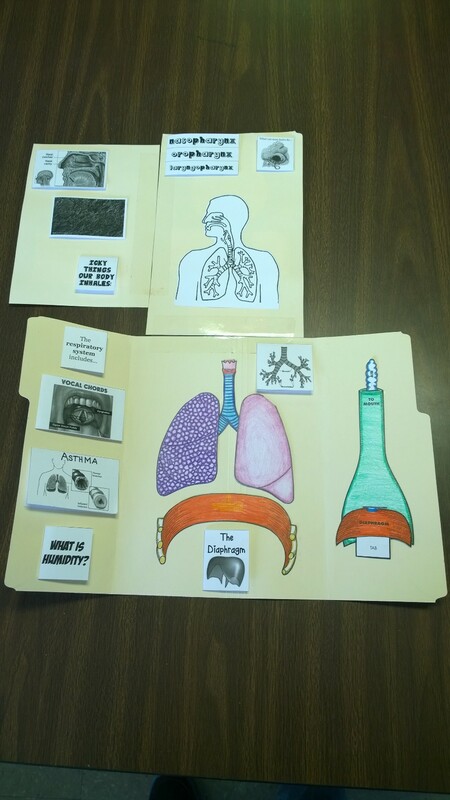 L1 Lapbook – Spontaneous Generation – This is a supplemental foldable. L1 Lapbook – DNA – This is a supplemental foldable. L1 Experiment – Mummifying an Apple – This can be found on page 21. L1 Experiment – How Magnification Works – This can be found on page 26. L1 Experiment – Choosy Cell – This can be found in Apologia’s Exploring Creation with Human Anatomy and Physiology Anatomy Notebooking Journal, Lesson 1. We also test in this class, and unfortunately, Apologia doesn’t have a “teacher’s manual” or a “test booklet,” so that just means we homeschoolers have to come up with one on our own in order to supplement our needs. So, below you’ll find the test I created. As an added blessing, there’s an answer key for you as well. Want to see what the lapbook looks like? I’ll show you Lesson 1. I’ve already started building Lesson 2, and you’ll see a little peek of it. but you’ll have to wait until we’ve finished before I show you that one. Here’s the first flap and parts of Lesson 1. Here’s the second flap which reveals the next part. Here’s the second part with more of Lesson 1.